The original KeySmart has two outer layers of lightweight aluminum held together with stainless steel hardware. The keys on the chain just keep adding up. The house .. the mail box ... bike lock ... and eventually the car keys don’t fit in your pocket or your purse. The main problem is the giant “O” ring we keep adding them to. Its not a life crisis but it is annoying. Annoying enough that a robotics engineer in Chicago quit his day job to invent a smarter system to hold your keys. The original KeySmart has two outer layers of lightweight aluminum held together with stainless steel hardware. Up to eight keys are layered between the outer layers so they face each other while not in use. Spin a key out to use it. Following a successful introduction into the marketplace, extra features have been added including the QuickDisconnect to attach your auto fob, layers of tools and even a USB fob. The KeySmart Pro includes a mini LED flashlight and the Tile Smart Location system so you never loose the keys or your phone. 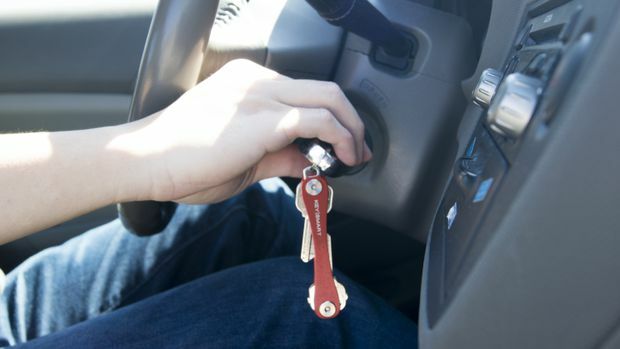 The KeySmart Rugged is the biggest model with enough space for 14 keys or accessories. Its like a sleek Swiss pocket knife with the ability to cut, screw, build, open bottles and all those doors in your life.